Release Date: August 5, 2016 – U.S.
Bazodee: The Trinidad word for someone who is disoriented or can't think straight. "Bazodee" is a joyful celebration of Trinidad and Tobago – a Bollywood love story told through infectiously upbeat Soca music. Bright and colorful locations showcase the islands beautifully, but it's the even more colorful people in this film that really capture the country's spicy flavor. They're a unique cast of local characters that could come from nowhere else but Trinidad. Ram Panchouri (Kabir Bedi) is opening a state-of-the-art resort in Trinidad. His innovative ideas have been described as "visionary." His daughter, Anita (Natalie Perera), is engaged to Bharat Kumar (Staz Nair), who is the son of his business partner (Kriss Dosanjh). Bharat's two brothers, Partiv (Rahul Nath) and Nikhil (Valmike Rampersad), could not be more different. Partiv is nice, shy, and unassuming; Nikhil is suspicious and bitter. 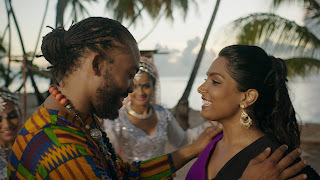 Even though Anita is about to be married, what really sweeps her off her feet is the music of a local legend named Lee (Machel Montano). Such is his level of talent that he was invited to play on the big stages of London. Then he gave up music and "disappeared." A chance meeting – is there ever any other kind in the movies? – brings Anita and Lee together. His music makes her so "bazodee" that she doesn't think twice about singing one of his songs outside a crowded airport. (Maybe I'll try that the next time I'm in Trinidad!) He recognizes his own lyrics and joins his admiring fan in a duet. Then, just like that, he's back in the music game. It seems a bit sudden, but if someone came up to me and started reciting one of my film reviews, I might feel similarly inspired! Romance and business, of course, will eventually intersect and inevitably clash. "Bazodee" breathlessly bounces from one grand celebration to the next: an engagement party, a trip to Pigeon Point in Tobago, and – of course – Carnival (the U.S. equivalent of this world famous Trinidad celebration would be Mardi Gras in New Orleans). Lee and Anita are such good, purehearted people that it's impossible not to root for them. Even when they're doing wrong, it's for the right reasons. Anita is a natural beauty. She's easy to fall in love with. Everyone will want to "thief" her away from the "Soca boy" after seeing this movie. 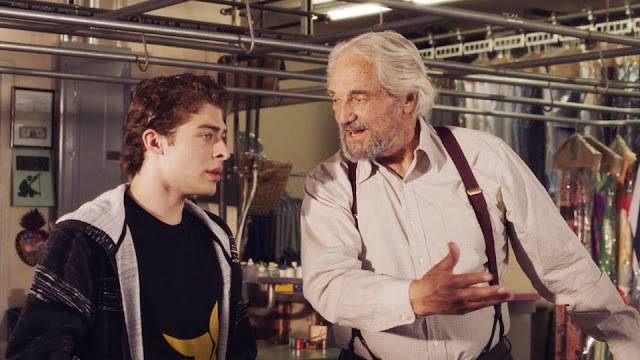 Of all the side characters, my favorite is probably Bud (Chris Smith), Lee's best friend and business partner. 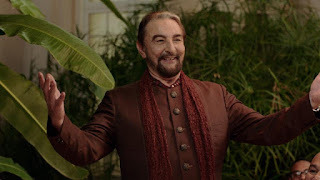 Like many of the people in this movie, he reminds me of someone I know. There's a great scene near the end with Lee and his grandmother. Without saying a word, she speaks volumes. "Bazodee" is filled with authentic Trinidad touches. A large part of the film's charm comes from listening to everyone converse – especially when they use Trini slang (Bazodee, Dred, etc.). Along with the British English accent, there is no accent more pleasurable to hear than a Trinidad accent. It has such a lyrical, rhythmical quality to it. It sounds like family. Its mentions of London and Miami also ring true. When you're in Trinidad, every part of Florida suddenly becomes "Miami." Even people who have moved from "Miami" to Trinidad eventually start thinking of the entire state as Miami. During the movie, mention is made of someone now living in Miami. I wonder if it's actually Boca, Tampa, Jacksonville, or Tallahassee. Then again, maybe it really is Miami. Now, that would be a twist of M. Night Shyamalan proportions. As you walk out of "Bazodee," you might find yourself singing and humming. It's a lovely movie. "Bazodee" is now playing in "Miami."